乔艳, 周前进, 李孝军, 苗亮, 陈炯. 2019. QIAO Yan, ZHOU Qian-Jin, LI Xiao-Jun, MIAO Liang, CHEN Jiong. 2019. Oceanologia et Limnologia Sinica, 50(2): 324-335. QIAO Yan, ZHOU Qian-Jin, LI Xiao-Jun, MIAO Liang, CHEN Jiong. 2019. 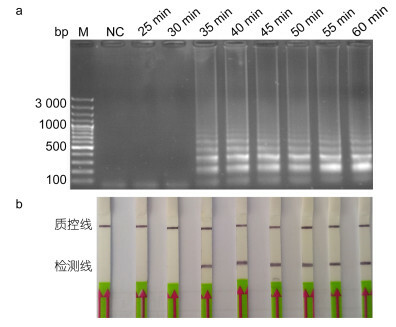 A LOOP-MEDIATED ISOTHERMAL AMPLIFICATION TECHNIQUE COMBINED WITH A LATERAL FLOW DIPSTICK FOR THE DETECTION OF ANISAKIS SIMPLEX SENSU STRICTO/ANISAKIS PEGREFFII IN COMMERCIAL FISH[J]. Oceanologia et Limnologia Sinica, 50(2): 324-335. Abstract: Anisakis simplex sensu stricto (s.s.) and Anisakis pegreffii are two sibling species of morphospecies A. simplex, which are fish borne zoonotic parasites dominantly responsible for human anisakiasis. A novel loop-mediated isothermal amplification (LAMP) combined with a lateral flow dipstick (LFD) was developed for the visual detection of A. simplex s.s./A. pegreffii (named LAMP-LFD) in commercial fish. Six primers that specifically recognized the conserved region of ribosomal internal transcribed spacer 2 sequence (rDNA-ITS2) of A. simplex s.s./A. pegreffii were designed, and the (fluorescent) LAMP assays were performed. The LAMP products were biotinylated and hybridized with a fluorescein isothiocyanate-labelled probe and visualized for 3-5min by trapping at LFD test line. The results showed that the LAMP-LFD method could specifically detect A. simplex s.s./A. pegreffii from other 10 worm species through a 40-min nucleic acid amplification at 63℃. The detection limit was 6×103copies/μL of recombinant rDNA-ITS2 of A. simplex s.s./A. pegreffii and the equivalent of 10-5 single third-stage larvae of both A. simplex s.s. and A. pegreffii. The epidemiological investigation by the LAMP-LFD method was accord with that of the DNA sequencing of rDNA-ITS1-5.8S-ITS2, which indicated that A. pegreffii are dominant Anisakis species of marine fish in the East China Sea. Therefore, the LAMP-LFD method enriches in rapidity, sensitivity, and accuracy and has great potential in the routine detection and quarantine of A. simplex s.s./A. pegreffii in commercial fish.